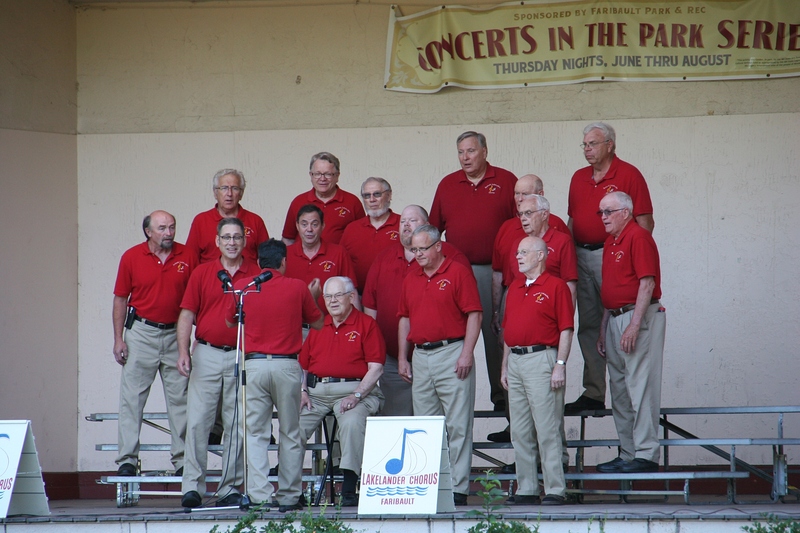 The Lakelanders Barbershop Chorus performs in the Central Park bandshell on July 23. WHILE BARBERSHOPPERS CROON, artists create. Music and art. Art and music. 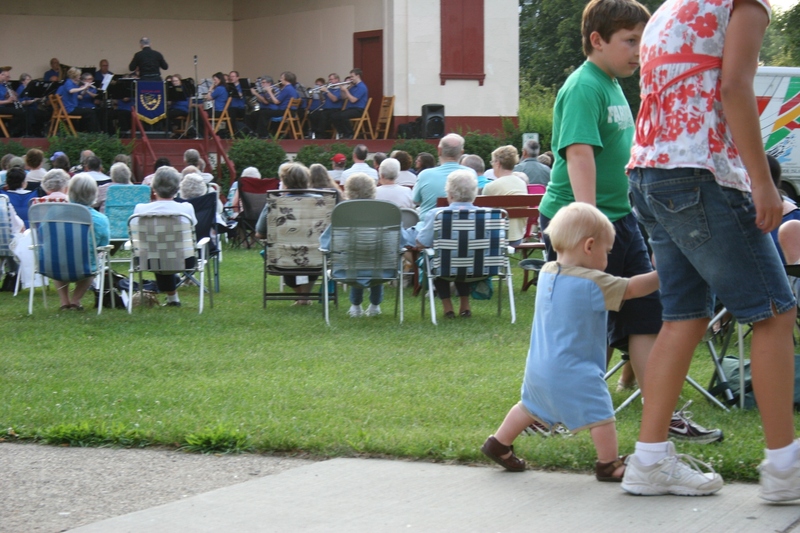 It seems the perfect mix for the annual summertime Concerts in the Park series held each Thursday in Faribault’s Central Park. 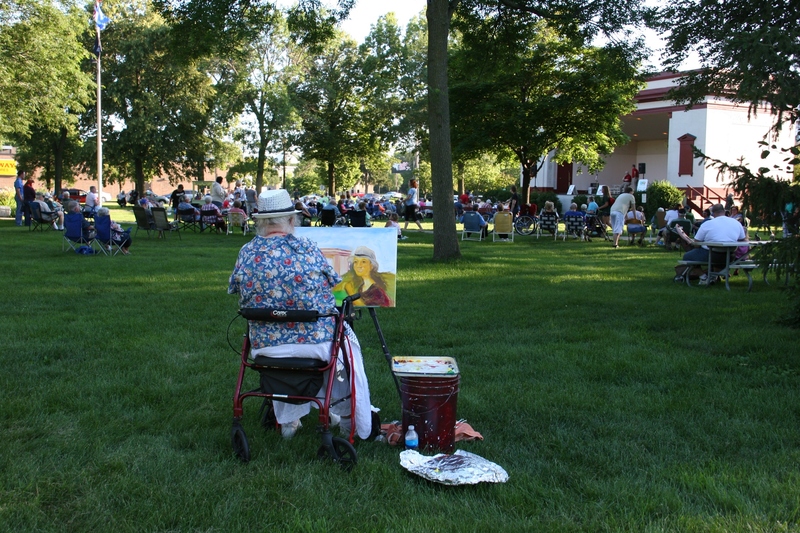 Pat Johnson has been at the concerts every week with her easel and paints. 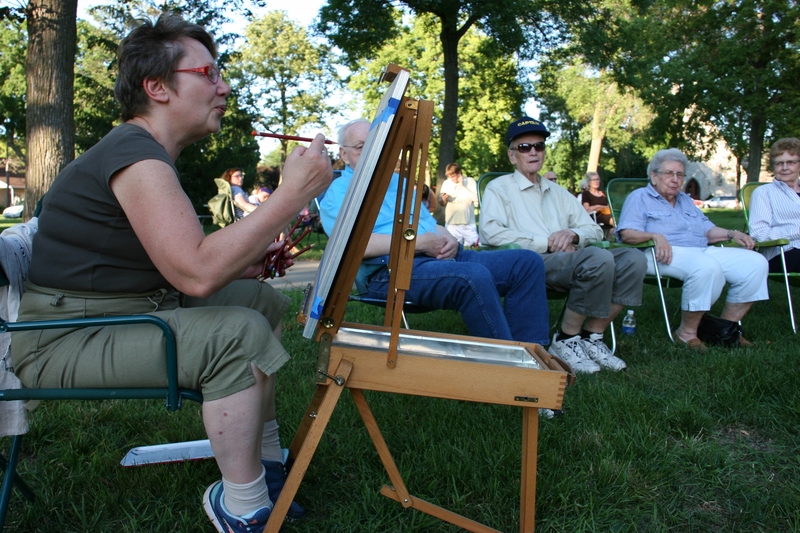 Last week I attended a concert for the first time this season and delighted in the en plein air artists scattered around the park with their easels and art supplies. They are new to the concert evenings, an idea of Jeff Jarvis, Faribault Park & Rec Enrichment & Communications Coordinator. 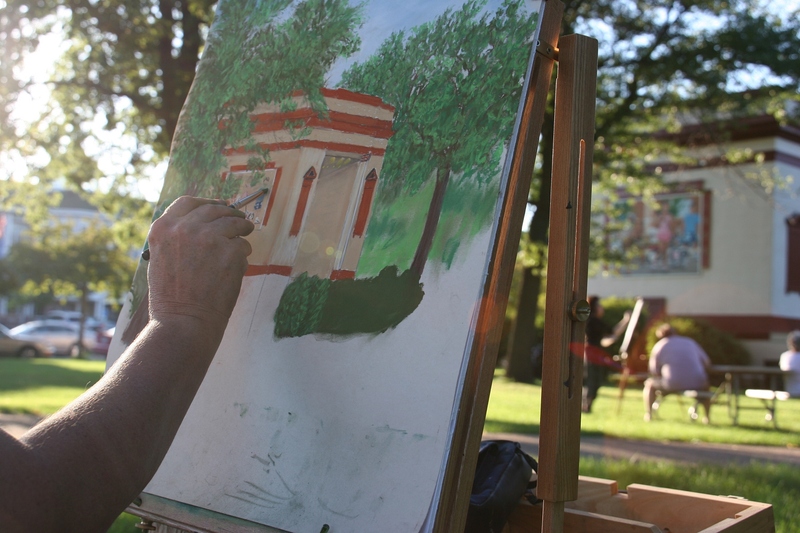 Pat Johnson paints en plein air. 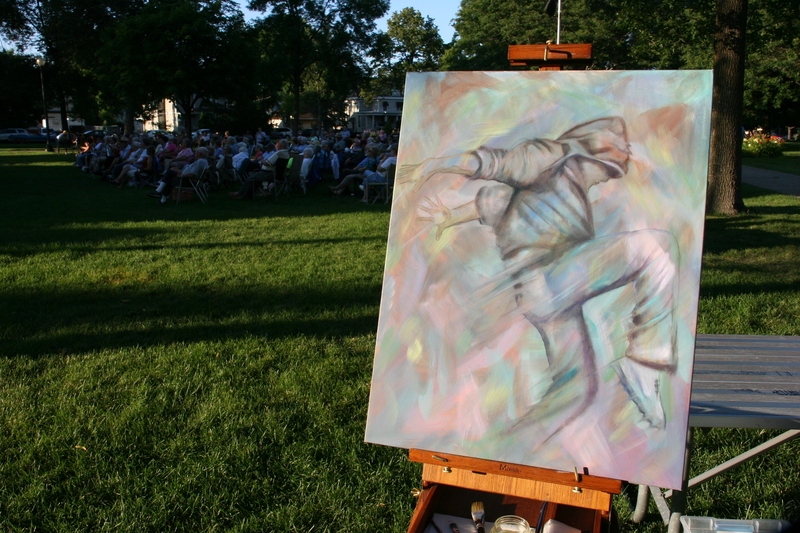 Jeff tells me the addition this year of artists injects even more spirit into the evening, provides an educational experience for concert goers and assists artists in developing en plein air painting skills in an openly musical and public setting. To keep the selected artists focused in the moment, they’re required to create music-themed artwork. 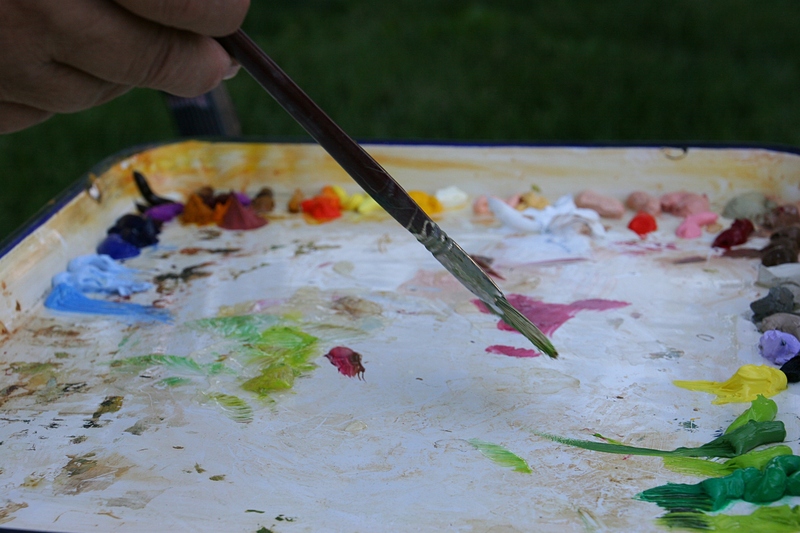 A vintage enamelware tray holds Pat Johnson’s oil paints. Pat Johnson of Morristown was dipping brushes into oil on a vintage enamelware tray when I paused to watch her create a portrait of a young woman she’d previously seen at a concert. An artist for sixty years, she says painting is her passion. She’s happy to sit at the park, listening to the music and visiting. “I have been blessed with the people I’ve met,” she smiled. Tami’s tools lie at her feet. 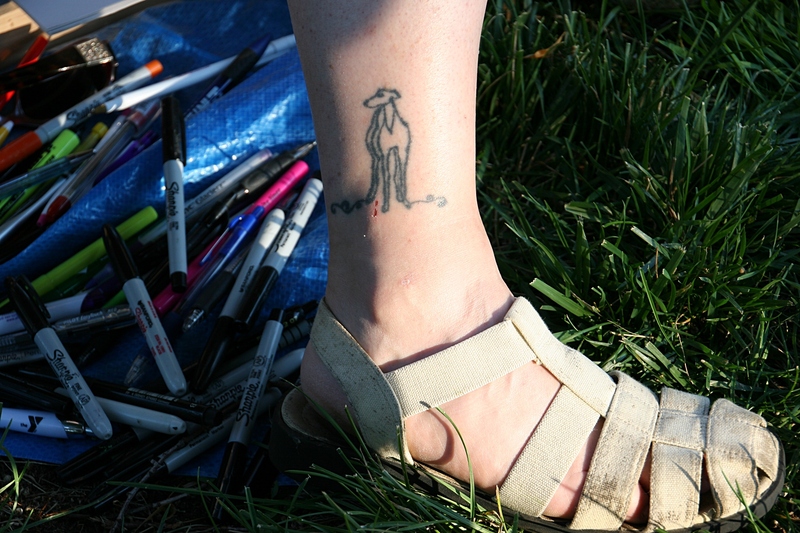 Years ago, Tami designed and got the greyhound tattoo in Kanub, Utah, after attending the Greyhound Gathering there. The Gathering raises monies for greyhound rescue. Barbershopper details in Tami’s art. 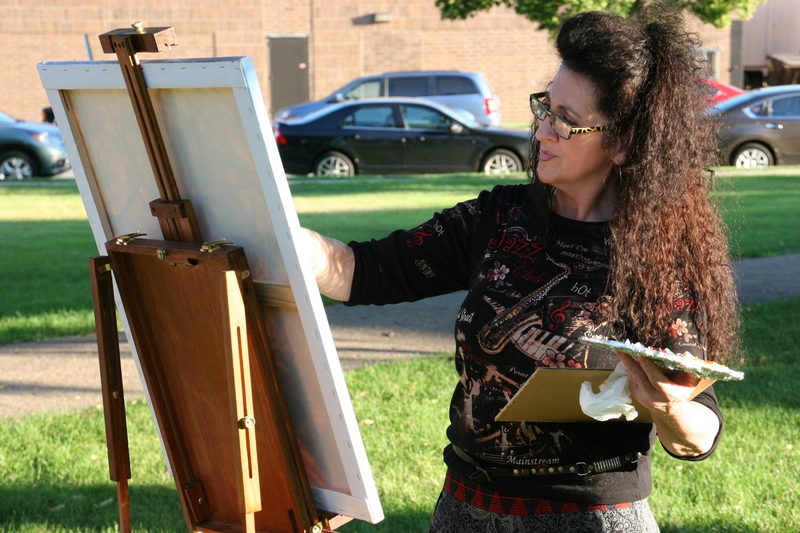 To the side of the bandshell, Faribault artist Tami Resler was surrounded by her “fan club,” a cluster of family and friends there to support her and enjoy an evening together. 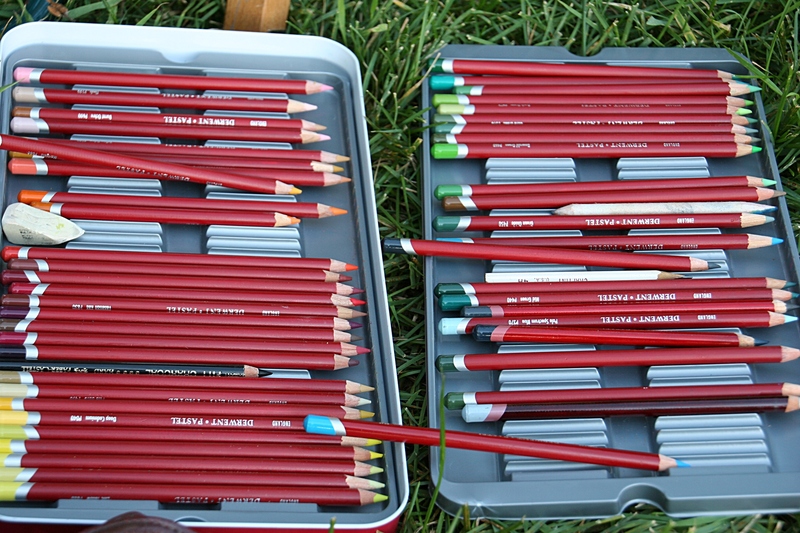 She was drawing with Sharpies and pencils—snippet details of a park sign, a trash barrel. 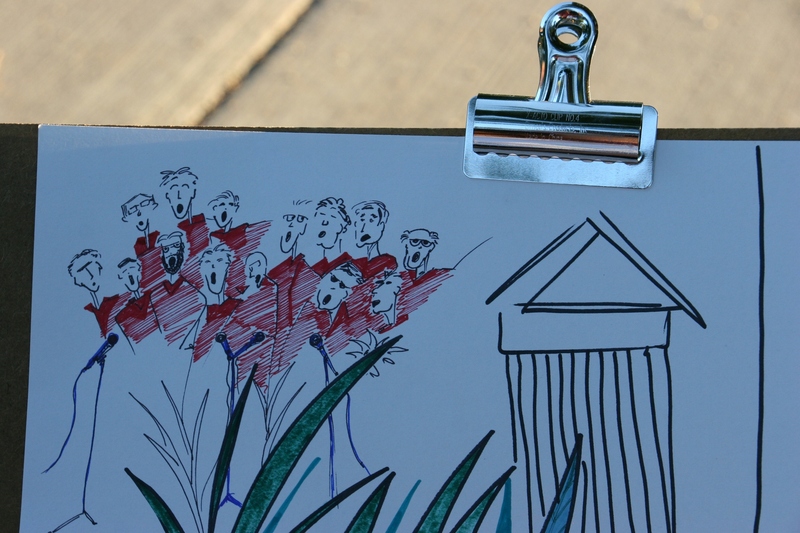 Later I returned to see the faces of the Lakelanders Barbershop Chorus flared into the corner of her art piece. 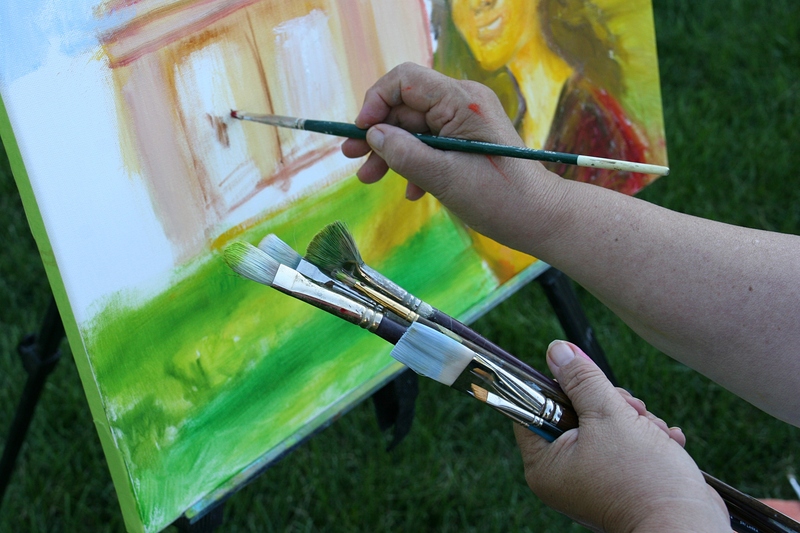 Irina Mikhaylova works on a portrait of the couple in the background. Irina at work with her pastels. 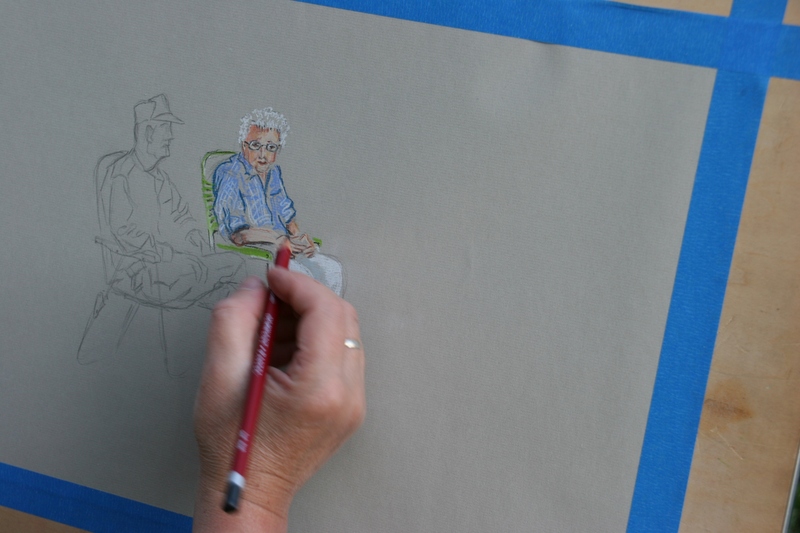 Nearby, Irina Mikhaylova used pastels to color the sketch she’d done of two elderly concert goers settled into lawn chairs. It was sweet, a lovely capture of older folks who primarily comprise this audience. There is something sweet, too, about Irina, about the thick accent that traces to her native St. Petersburg, Russia. She now lives in Morristown. Because she cannot work in the U.S. as a mechanical engineer—her former profession—she has thrown herself into her art. 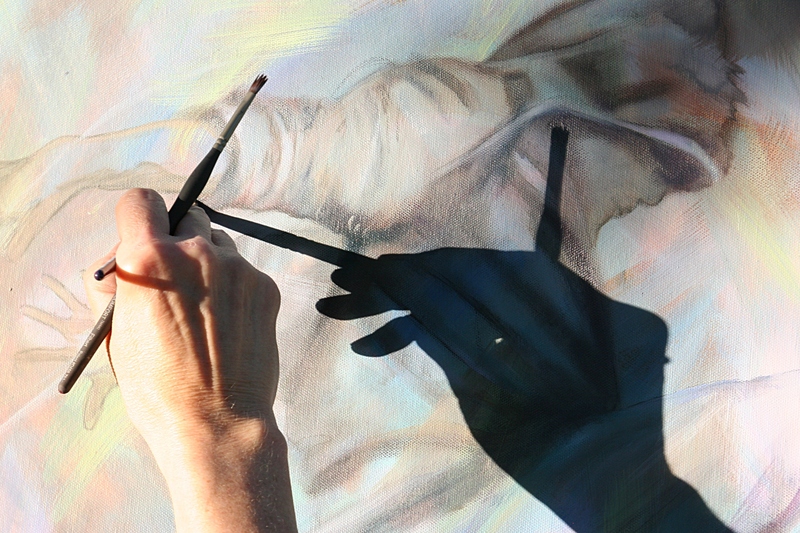 Shadows and light play on Barb Bruns as she works. 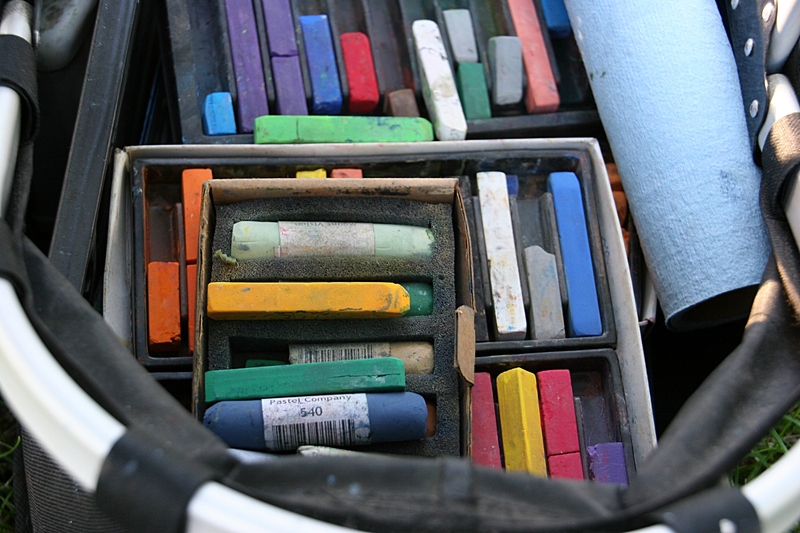 Some of Barb’s corralled pastels. Barb’s in-progress interpretation of the Central Park Bandshell, in the background to the right. 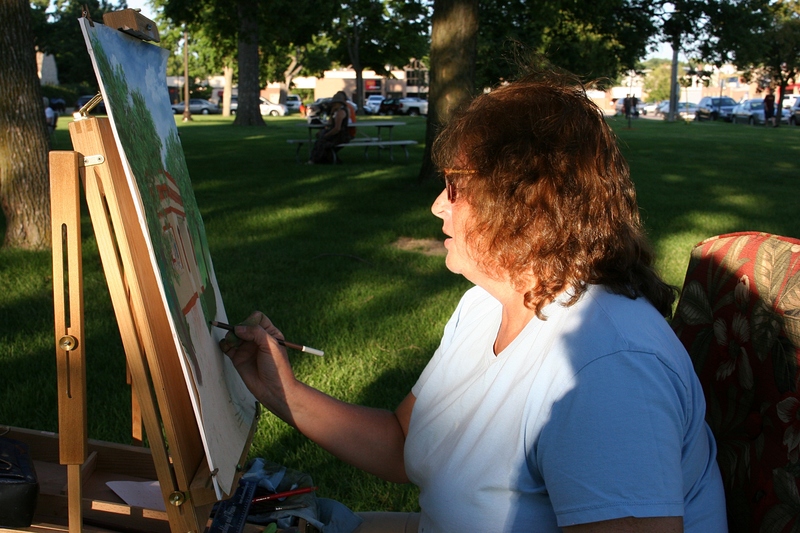 On the other side of the park, Barb Bruns talked to me about blogging as she worked pastels across paper to recreate the bandshell, and the pet parade mural thereon. She is more than an artist. In Morristown, Barb operates Barb’s Custom Framing & Gift Shop with a local gallery at the front of her shop. 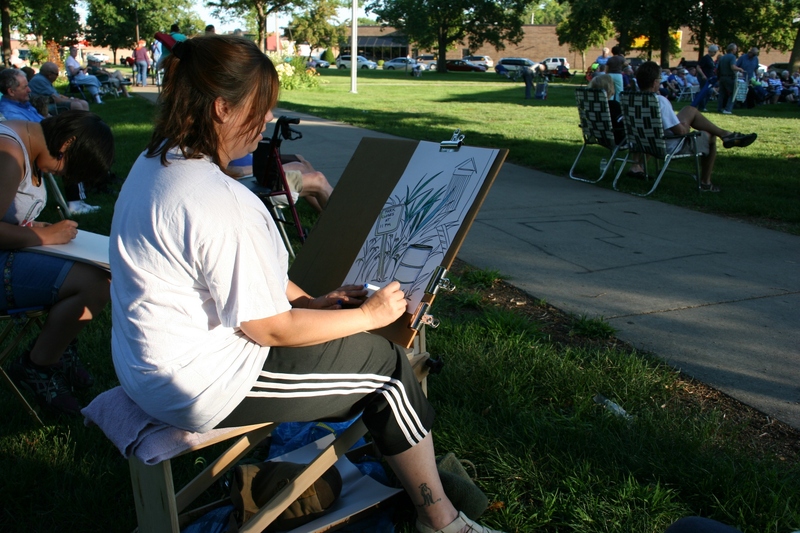 It features the work of 27 local artists. The sun shadows Dana’s hand across her art as she paints. A stone’s throw from Barb, the sinking sun spotlighted the mesmerizing art of Dana Hanson who, by freelance trade, creates art for her Lord Warmington Studio. Her grandmother, Frieda Lord, helped found Faribault’s art center. By day Dana works as a baker/cake decorator at Fareway Foods, just across the street from Central Park. On this evening, her art danced as she brushed oils into the shape of a hooded dancer in halal, the Hebrew word for praise. Praise seems a fitting response for the addition of artists to the concerts. Jeff Jarvis confirms the enthusiastic reception. “Youngsters have emerged from the crowds to sit with ‘real’ artists—they even come back with their own art supplies to join in,” he cites. Jeff, himself a visual artist, understands the financial and other challenges artists face in getting their work out there. “I wanted to elevate the status of visual artists by paying them to perform alongside the musicians,” he says. He accomplished that by securing a grant through the Arts & Cultural Heritage Fund. In addition to Jeff and the five artists I interviewed, Nicole Volk, Linda Van Lear and Julie Fakler have also been among the Concerts in the Park artists. Jeff selected local and emerging artists who enjoy working outdoors. The best works of each artist will be featured in a capstone exhibit September 8 – 11 at the Buckham Center Commons area with the opening reception from 7 p.m. – 9 p.m. on Tuesday, September 8. 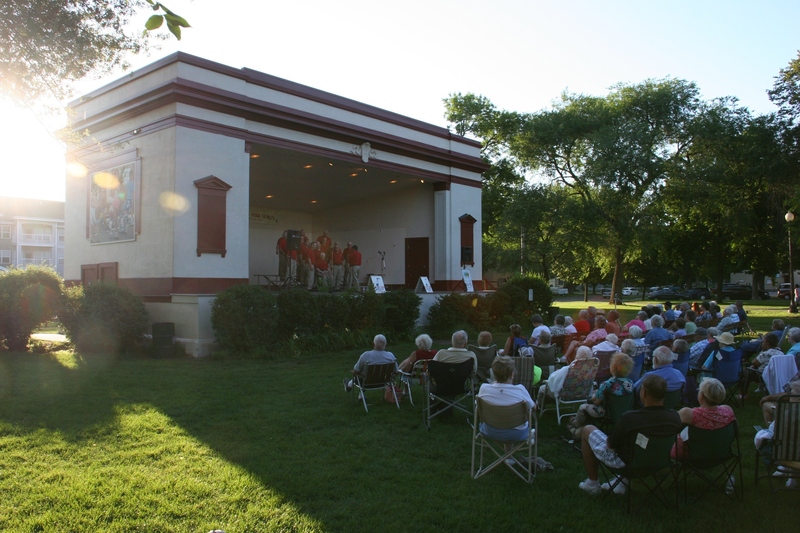 FYI: The Concerts in the Park series continues for four more Thursdays with the Copper Street Brass Quintet performing July 30; Bend in the River Big Band on August 6; Jivin’ Ivan & The Kings of Swing on August 13; and The Bandshell Brass on August 20. Please check back tomorrow for a story about a young entrepreneur who set up shop at the July 23 Concerts in the Park event. Plus, I will show you a few more concert images.